A family reunion should be a happy event, a time to see familiar faces, meet new relatives, and reconnect with people you haven't seen in a while. But the Lynch family reunion wasn't a happy event at all. It was the beginning of a terrifying connection between three cousins and a deranged woman who, for a brief time, had been a part of the family.When these four are reunited, a bond is formed a bond that fuses their souls and reveals dark, chilling visions of a tortured past, a tormented presently and a deadly future -- not only for them, but for their entire hometown. But will these warning be enough to enable them to change the horrible fate they have glimpsed? It all starts during the Lynch family reunion. Lindsay Hollin is wife to Hank, and mother of two girls, one of whom is mentally slow and was born without eyes. Norris Lynch has worked a variety of dead-end jobs before becoming a school teacher at an institution for society’s misfits and troublemakers. After an error of judgment involving a young man, Norris finds himself in a bit of trouble. Bernie Lynch abandoned her earthly possessions to find God. The three cousins reconnect with relatives they haven’t seen in a while, including an “odd and smelly” girl who was once a part of their family. When Lena collapses at the reunion and Bernie comes to her aid along with her two cousins, a mysterious connection occurs between the four of them. All three have terrible visions of the past, present, and future that involve the odd Lena, themselves, and their hometown. This story explores family relationships and secrets, small-town bigotry, and the deeds of a malignant group of people that hate anyone who is different. 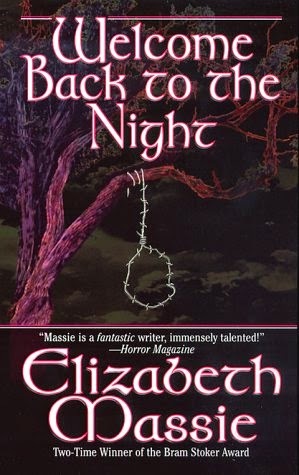 Elizabeth Massie is a master at creating unforgettable, twisted, and evil characters and a gripping, fast-paced story. The buildup of tension and atmosphere is intense right from the first page. I was gripped by a terrible sense of foreboding and had a very difficult time putting the story down even though it made me sick to my stomach. Thankfully, this very dark story ended with some hope. Sensitive readers, beware! There are some very graphic scenes of torture and murder.